The Giro d'Italia hasn't been kind to Christian Vande Velde (Garmin-Transitions) over the past year, with the American hitting the pavement in stage 3 for the second year in a row and being forced to abandon the race. Vande Velde was involved in a crash with around 30 kilometers remaining in the stage, and looked to have injured his shoulder or collarbone as he waited for a replacement bike from the team car. He wasn't able to continue as a result of the injuries sustained. Last year Vande Velde was using the Italian Grand Tour to build up for the Tour de France, where he proved to be the revelation in the 2008 edition, unexpectedly finishing in fourth place overall. He broke five vertebrae, a rib and his pelvis one year ago, but was able to fight back from injury and remarkably managed another top ten in the Grande Boucle. It hasn't always been all bad for the American in the Corsa Rosa. 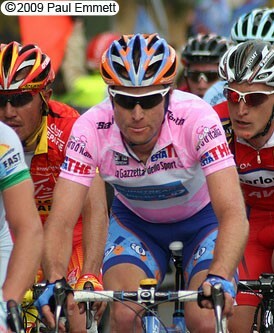 In 2008, when he rode to fourth place overall in the Tour de France, Vande Velde wore the maglia rosa in the Giro d'Italia for the first two stages following his team's team time trial win. This year he will be the sole leader for the team in July, after former teammate Bradley Wiggins headed to Team Sky in a controversial off-season transfer. Now the 33 year old will be forced to miss valuable preparation for the Tour de France, but will hope his injuries aren't as severe as they were last year so he can do another solid ride in the overall.